CDXRouteMP is a right-click function available in the MapPoint, Basic and Premium versions of CDXZipStream. Using Microsoft MapPoint® (North American and/or European versions), the function automatically calculates the driving distance, driving time, directions or cost between addresses as well as optimizes complex routes. It can be employed as a right-click function as well as input directly into your worksheet as a custom function formula. (Please also refer to the help section on custom functions.) 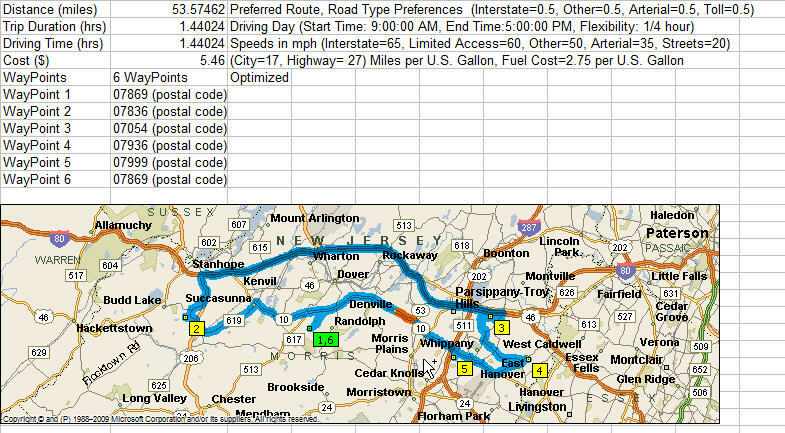 Driving time can cost can be optimized for specific driver profiles with the Route Settings function. 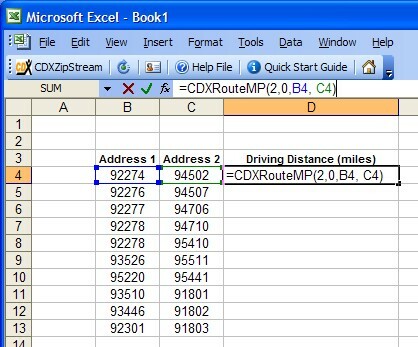 Route Maps can also be embedded in your spreadsheet using the CDXRouteMP right-click function. A Trip Summary feature is now available listing key results and setting as well as embedding a route map in a single step. 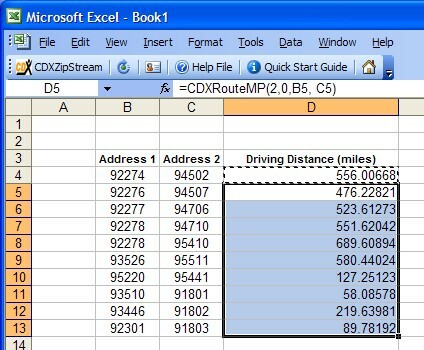 Please refer to the Youtube video Driving Distance Calculator in Excel for a quick demonstration of the CDXRouteMP function. Before using CDXRouteMP, you must install Microsoft MapPoint. CDXRouteMP is compatible with the 2002 through 2013 versions of MapPoint. A free downloadable trial of Microsoft MapPoint is available here. If your version of MapPoint includes a run CD, it must be inserted in your PC drive. Address 1: The beginning point of the trip or the range name containing all the stops in your trip. 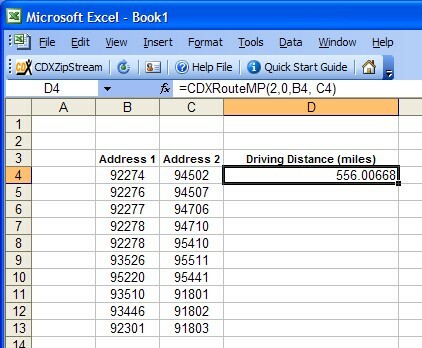 You may use the actual zip code (such as "06830") or the worksheet cell location of the zip code ("C4"), or the range of locations ("C4:C5") in Excel. Address 2: The end point of the trip. This is only required when you only specify one address in the first address field. You may use the actual zip code (such as "06830") or the worksheet cell location of the zip code ("C4"). 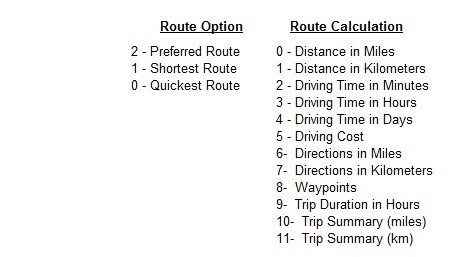 Route Calculation: Choose Distance (in miles or kilometers), or Driving Time (in minutes, hours, or days) or any of the other available options. This is the resulting output that will display in the worksheet. 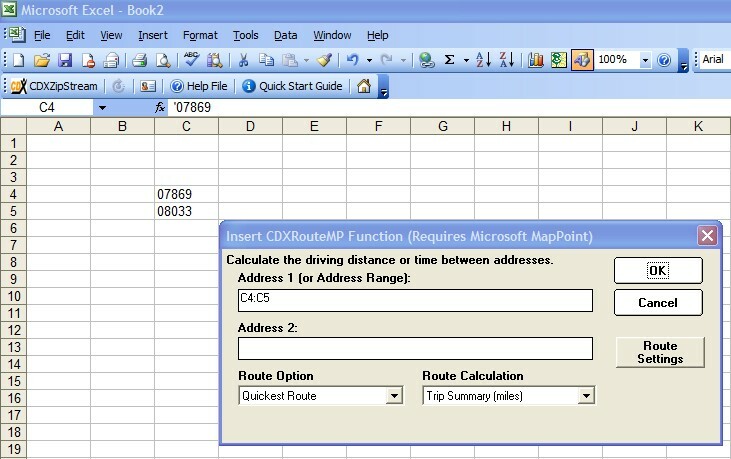 You can also specify to embed a route map created with MapPoint into an Excel worksheet or create a Trip Summary report in miles or kilometers. Either the full state name or two-letter abbreviation can be used. If there is a discrepency in the address information (the zip code is incorrect for the city or state provided) or a misspelling, the returned output will be "Ambiguous or Invalid" for that address. If you are doing a multi-country analysis you should also add either "U.S." or "Canada" after the text. 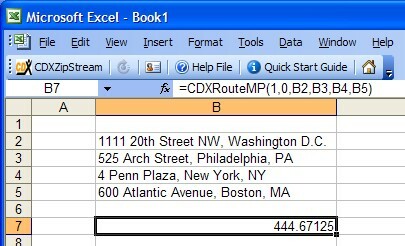 This cut and paste technique will also work if the zip codes are listed in rows instead of columns as shown here. Route Driving Time and Driving Cost can use specific driver profiles that take into account items such as speed, fuel cost and other options. To set these parameters, using the "Route Settings" button on the "CDXRouteMP" right-click dialog shown below. CDXZipStream can now optimize complex routes of 4 stops or more. The "Optimize Route" options in the settings dialog must be checked. The MapPoint optimization routine will minimize the times between specified stop and then CDXZipStream will apply the chosen route option between stops. The Trip Summary feature is a convenient way to get access to all result items in a single step. Reports can be created in miles or km. The summary includes driving distance, time, duration,cost and a summary of the settings used to create the report.